I’ve always wanted to have a chalkboard feature wall in the house. You see photos of them in home magazines and they look amazing, often with artistically written reminders on them, like – “buy cereal, eggs, tissues”. The reality is, I hate mess. The thought of actually having chalkboard dust all over the floor, smeared all over other walls and the high probability of my boys drawing on non-chalkboard paint walls, it just ain’t happening. We have enough problems with the toddler drawing on the walls already… So we went for the next best thing. DIY chalkboards outside! The front of our shed has a huge blank wall that was in need of something to cover it up. Plus, it is under a carport so it is protected from the weather. Our idea was to make chalkboards for the kids to use, so they could be in the shade when it was hot, or even out of the rain and stop us getting cabin fever in the colder months from being cooped up inside. There is so much work we are wanting to get done in the garden, but anyone with kids knows that this isn’t as simple as just getting it done in a couple of weekends, like we used to be able to before kids. But this way, we could all be outside together, we could keep an eye on the kids, they were happily playing and we were actually getting stuff done in the garden. Everyone’s happy! We had some leftover decking boards from our back deck which my husband used as the frame for the chalkboards. He bought two large sheets of plywood from Bunnings (about $15 all up) and we had been given some leftover chalkboard paint from friends. A budget DIY project! Our original plan was to make one huge chalkboard, but unfortunately, the timber was warped. Instead, he cut the decking boards into two shorter lengths and made two frames for the plywood boards. Now it was straight 🙂 The plywood was screwed to the frame and then screwed to the shed wall. I painted two coats of the chalkboard paint on the boards, and voilà! Two brand new chalkboards for the boys to enjoy! All up, it took about an hour and half to put together and paint. I’m sure some people could get it made quicker, but our eldest was determined to help by passing screws, and being the site supervisor! It actually worked out perfectly having two boards, instead of one large one. This has minimised arguments over who is using what space on the chalkboards. They each keep to their own board and so far, haven’t drawn over each other’s artistic designs! The chalkboards are about 1.5m long x 1m high – plenty of space for games of noughts and crosses, random scribbles and writing messages to each other. Our next outdoor project for the kids is a cubby house! 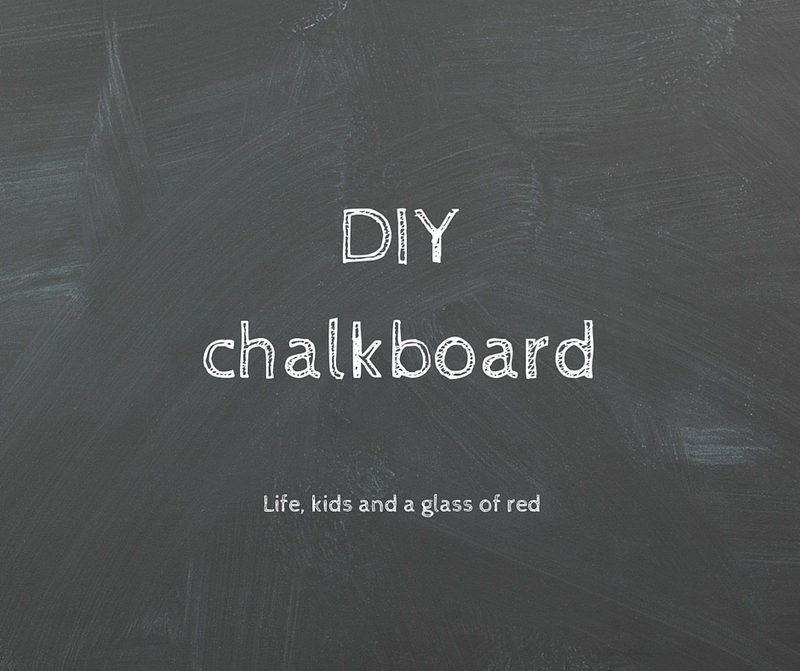 Have you made your own chalkboard? Do your kids love drawing on it too? They’re great to have, I even have friends without kids who use them and they’re perfect for reminding yourself of things you need from the grocery store or appointments! They’re awesome, and a bit of a boredom buster too! They’re so handy to have outside, the kids know they can go nuts drawing on them. It helps reinforce (but still not always followed) the whole “we don’t draw on the walls in this house” rule! Wonder how it would stand up to the weather? We don’t have a spot that would keep it dry. Such a great idea and so inexpensive and easy to do! Winning! Also, so on trend, because chalk boards are SO in, right now! And so easy to make! I think they’d be awesome at preschools and childcare centres too, I only ever see small easel style chalkboards there. A chalkboard wall could prove very popular with the kids! It’s a win – win! I saved a table that my parents made for me for when I had children. When I re-painted it for my daughter I used chalkboard paint for the top. We love it! That’s actually a genius idea – I love the idea of chalkboards but the dust would drive me mental! We have a chalkboard wall in our kitchen. Our son can’t reach it yet but I love writing nice messages on it. We don’t have issues with dust because I use a damp cloth to wipe it off. Great idea here. I think we are going to do the same under Elliott’s cubby house.